Snail Cream: Worth The Hype Or Just Fancy Slime? Snail slime, or mucin — the stuff snails excrete from their undercarriage while they go about their business — has been slowly slithering its way into skin care. The slime that helps quickly heal snails’ bodies as they travel over jagged terrain is touted as having antioxidant, brightening, and regenerative powers. No surprise, then, that snail mucin is popping up in beauty products. Although the ancient Greeks used snail slime as an anti-inflammatory for skin, it was the recent marketing efforts of Chilean snail farmers that launched mucin into the beauty world. They discovered that handling snails for the French escargot market seemed to be doing wonders for their hands (making cuts heal quickly and making their hands look younger and feel softer). Soon after, the Chilean brand Elicina came out with a “snail cream” that now has a cult following. And, who could forget the recent (and possibly nightmare-inducing) footage of a spa in Tokyo that features live snail facials? The snail facial consisted of a few huge snails promenading over a woman’s face, depositing their slime as they moved around. It even included trained “snail facialists,” who made sure that the snails kept away from clients’ eyes and mouth. For those of us who can't get Live Snail Action on our faces, there's Korean brand Missha and its Super Aqua Cell Renew Snail Sleeping Mask, with 15% snail mucin. The mucin is harvested ethically, according to Missha, and with tremendous patience: It takes a snail six hours to secrete a single gram of mucin. The paraben-free mask also contains Baobab tree seed oil to help lock in moisture. You’re supposed to apply it at night, and rinse it off in the morning with water. I’ve worn the mask/night cream for the past four nights, and its soothing and moisturizing properties are excellent. For those who might be weirded out by the idea of putting something with snail slime on their faces, the Snail Sleeping Mask has a refreshing scent that might make you forget what’s inside it. I have sensitive skin, with some dry, itchy patches on my neck. The first night, I felt mild tingling on those sensitive areas, so if you’re going to try the mask, I’d avoid putting it on hyper-sensitive areas. Snail mucin is supposed to have proteins similar to glycolic acid, so there’s a mild exfoliating effect going on. But otherwise, the mask felt soothing and gentle on my skin. I woke up to a pretty greasy face, but the trade-off — smooth, moisturized skin with no dry patches — is worth it. 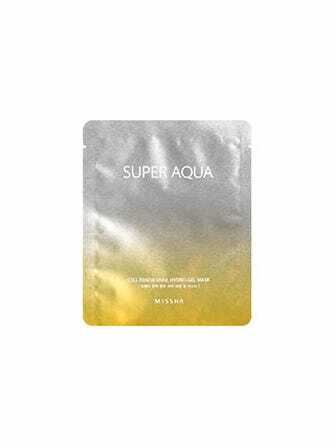 Missha Super Aqua Cell Renew Snail Gel Mask, $6, available at Missha.